AMMONNEWS - Jose Mourinho said he wouldn’t have wanted to pay money to watch this match - but the Manchester United manager had to admit there were a couple sparkling goals. 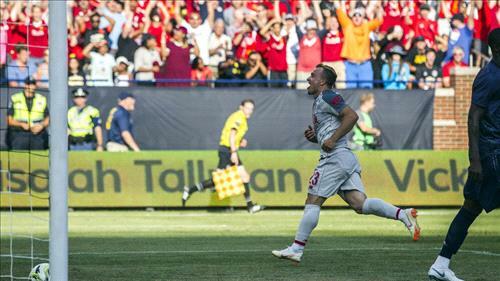 Xherdan Shaqiri scored on a spectacular bicycle kick in the 82nd minute, capping a three-goal second half for Liverpool in a 4-1 victory over Manchester United on Saturday. Sadio Mane, Daniel Sturridge and Sheyi Ojo also scored for Liverpool in this International Champions Cup matchup at Michigan Stadium. Andreas Pereira provided a highlight for Manchester United when he scored on a well-placed free kick in the first half. The teams weren’t at full strength, but the crowd of 101,254 didn’t seem to mind too much. Liverpool did have Mohammed Salah in the starting lineup, and he drew the penalty kick that Mane converted to open the scoring. Pereira equalized with a free kick that went over the wall and into the top corner of the net. Shaqiri set up the goal by Sturridge that put Liverpool ahead 2-1 in the 65th minute, but the highlight was his left-footed overhead kick that made it 4-1. Ojo’s goal came on a second penalty kick for Liverpool, and the always-outspoken Mourinho had some choice words about the officiating. “The majority of the clubs, we cannot give the people the real quality football, which is I think what can attract even more passion in this country,” Mourinho said.